DESCRIPTION: This very substantial brick built and roof tiled cottage has a central entrance with porch over. There are chimneys at either end. Originally Moss Cottage was a pair of two bedroomed cottages identical to 330-332 (now extended) and 334-336 (demolished in 1970’s). The two front doors, (see plan) opened into the Front Room, with a door located immediately inside, on the left or right, giving access to the stairs which led up to the bedrooms above. One of the bedrooms was on the open landing and the second off it through a door. There are no rear windows on the first floor, the roof sloping down to the ground floor. These three pairs of cottages were presumable all built at the same time for colliers or farm workers. 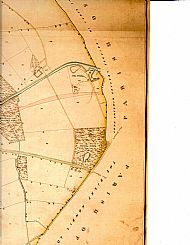 The colliery at this time being located by the Canal to the South of Balloon Wood. By 1848 the two cottages had been knocked together, as they were then occupied by James Taylor the “Colliery Agent” or manager, who no doubt required a bigger cottage. The two separate doorways were closed with brick work with a window above. (See left cottage doorway, right.) A new central door was inserted leading to a new hall, which was created by the removal of the right hand staircase. This explains why the doorway is not exactly in the centre of the building. The two cottages c 1840, with two separate entrances and stairs leading to the two bedrooms. 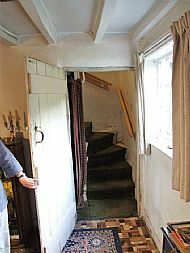 Above, right, the new central door and Hallway which replaced the stairway in Cottage A.
Upstairs, above the Hallway, the main post of that former staircase has been cut down, and floored over so converting the former landing / bedroom of Cottage A into a separate bedroom, accessed from the remaining landing. Downstairs there are now two rooms on either side of the new hallway. To the right is the Living Room (below) which has three 19th century windows (one to the side) and its original wainscoting up to window level and original beams. The right window was the original doorway to cottage A. To the left of the Hallway is the Parlour, (below). This is identical to the living room, with two front and one side window. All appear to be 19th century. There is a fireplace on the external wall, and original beams. On the internal central wall there is a door to the stairs (below, left). The left window is the bricked up doorway of cottage B. That explains why the window is not actually the same size as the original right hand window. There are further rooms on the ground floor at the rear. These include the kitchen (with an old range). Before 1840 there would have been separate kitchens for each cottage with a central range with chimney above. The chimney must have been removed more recently when the existing range fell into disuse. There was a scullery (now a bathroom), Larder (with an original brick thrall) and a Store. This may have been a stable, added by James Taylor after 1840. He had a horse and the 1863 rent book shows he rented the cottage and the two adjoining pastures at the back, now developed with housing. The back of the cottage shows an angular roof coming down to first floor level, there being no rear windows for the bedrooms, as with many of the cottages on Trowell Rd. There are substantial outbuildings and the courtyard is paved with “WOLLATON” bricks. Upstairs there are now three bedrooms. The stairs lead up to the landing and then to Bedroom 3 with a blocked fireplace. (See left). 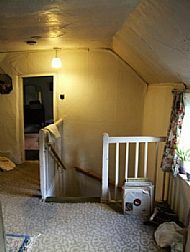 The Landing (below) would also have been the second bedroom of cottage B. Below, the landing and the door that was put into the former party wall giving access to the two bedrooms in cottage A, now bedrooms 1 and 2. To the right is the landing bedroom of No. 332, showing the party wall with No 330 and the stairs in 2003. According to Pamela (Bland) this was the same layout as in Nos 334 and 336, before they were demolished. Evidence that the three pairs of cottages ere originally identical. Bedroom 2, right, has a window at the front, whilst Bedroom 1 also has a window to the side, and an original fireplace. The windows appear to be original, the front one being a slider. The top third pane from the left was replaced in 1941 after an air raid. The frosted replacement being all that was available at the time! 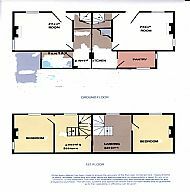 None of the bedrooms have rear windows because of the roof line. Outside there are outbuildings (above right) and a and a courtyard paved with “WOLLATON” bricks. 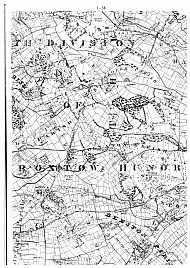 Sanderson’s Map of 1835 showing the three pairs of cottages, under the word “Balloon”, the location of the colliery and the Nottingham Canal under the letters XTO. James Taylor had six children and one of them was still living here in 1911. In 1925 Moss Cottage was sold by Lord Middleton to Wilfred Bland. He died in 1930 leaving a widow and an 8 year old son Harry, who lived here until he died in 2018 at the age of 95. 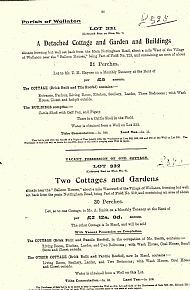 Below: Page 56 of the 1925 Sale Catalogue, giving the details of Moss Cottage. However both cottages have now been extended with additions at either end, beyond the chimneys on what were originally their end walls. They have also been greatly extended to the rear. Moss Cottage is listed Grade II. An 18th century cottage, it has survived most of the twentieth century untouched and, as such, is unique in Wollaton. Its original neighbours have been either demolished or seriously damaged by alterations. The same should not be allowed to happen here. Every effort should be made to ensure its preservation and the retention of as many of its original, or 19th century, features as possible. It has been known as “MOSS COTTAGE” for well over 100 years. Wollaton Historical and Conservation Society.